A group that I have the greatest respect for is the Foo Fighters. They rock hard, but always feel like they're coming from the right place, with all the emphasis on their music and their fans. That's probably because leader Dave Grohl experienced superstardom previously with Nirvana, so he was beyond the trappings of success as a result. Here's a song analysis of their song "Best of You," an excerpt from one of the editions of my new Deconstructed Hits: Modern Rock & Country. In their nearly 20 years of existence, the Foo Fighters have had a lot of hits, but “The Best Of You” is the only one to go Platinum, with sales of over a million units. The first single from their In Your Honor double LP, the song topped the Hot Mainstream Rock Tracks chart for four weeks, won the Karrang! Award For Best Single and was nominated for a Best Rock Song Grammy. 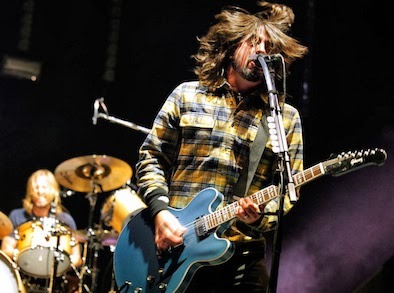 Although credited to all four of the Foo Fighters, the song was written by singer/guitarist Dave Grohl while he was supporting John Kerry for president in 2004. Like what has happened with so many other hits by various artists through the years, Grohl didn’t think it was worthy enough to be included on the album, but was persuaded by his manager to put it on. “Best Of You” was also covered by the artist Prince during his 2007 Superbowl halftime appearance. The song is built around the same general chord pattern that’s repeated in various combinations in the different sections of the song with the exception of the outro, which is a series of accents on the same chord as it builds to a crescendo. The song’s melody is strong although it doesn’t change much from verse to chorus. The lyrics are well-crafted in that they both read and sing well, tell a story and even rhyme well too. “The Best Of You” unusually begins on a verse with no intro whatsoever with just the vocal and guitar playing clean 16th notes (another Foo technique). At bar 9 a second clean guitar doubling the first is added on the right side, then a clean guitar playing an ascending line is added on the right side at the beginning of the chorus. Once again at bar 9 of the chorus, the bass is added as well. On the downbeat of the second verse the drums enter and guitars switch from clean to dirty and the intensity is increased by several notches. The snare and the bass play the same feel while the drums play 8th notes on the kick with a cymbal crash every other bar, and a harmony vocal is added on what almost might be considered a B-section at bar 9. At the chorus, the drums switch to playing the snare on every beat with a crash cymbal every bar, while the same ascending guitar as in the first chorus enters again, but this time more distorted. At the bridge the feel of the drums changes once again, with the playing being much more free with a lot of tom fills and cymbal crashes. There’s also a written lead guitar solo, and on the chord change at bar 9 the vocals enter singing “Oh,” which are followed by full band accents. The next chorus begins with a lyric change for 8 bars before the main chorus lyrics enters for another 8, with the bass doubling the same ascending line as the left chorus guitar. On the next verse, the intensity is brought down to what it was on the intro, with the guitars playing a soft, clean picking part against the lone vocal. At bar 9 the full band enters with yet another different 8th note feel with a full band stop on the downbeat of the last bar. For the last chorus, the drums return to the same 1/4 note snare feel as the second chorus while the bass plays again plays an ascending line. The outro is a series of high-energy accents on the same chord as the intensity builds at the end with a guitar playing a high octave bend. “The Best Of You” is the typical Foo Fighters wall of sound, which is a sonic blitz from the time the entire band enters in the second verse. The mix is very compressed, especially singer Dave Grohl’s doubled vocals, where you can hear the attack of the compressor grabbing onto some words, especially in the intro. The mix features some nice panning to keep multiple guitars out of each others way. The main rhythm guitar sits slightly left of center while another rhythm guitar doubling the part enters on the right, then a third guitar playing an ascending line enters on the left to balance the panning out. The drums sound pretty good but the kick is slightly lower in level in the mix compared to other rock songs. They’re also panned almost in mono with the cymbals only slightly panned to the left and right. The cymbals are mixed well in that they’re played a lot in each chorus that the band plays, but they never seem to take up a lot of sonic space like in many rock mixes. Listen Up:To the big breath on the vocal at the beginning of the song. To the guitars spread left to right in the soundfield. To the different drum feels in each section. To the compression on the vocal in the first verse. The Foo Fighters are known for their intensity in concert and they’re one of the few bands that are able to capture it on record as well. That’s partially due to the performances and partially because of their use of dynamics, in this case going from quiet to loud, back to quiet and ending with a fury of intensity. On “Best Of You” the production shows it’s sophistication with making a song that’s basically built over the same repeating chord pattern interesting, which is not a particularly easy task. This is done not only by the dynamics mentioned above, but also by the feel changes between the sections, as well the stops and accents, so that each section feels unique. While you’d probably never call any of the Foos except for perhaps drummer Taylor Hawkins a particularly great player, the intensity of the band overcomes musicianship ever time. Capturing that is the essence of production. To read other excerpts from the Deconstructed Hits series, go to the excerpts section of bobbyowsinski.com. Like you, Bobby, I too have the greatest respect for the Foo Fighters. When this song first came out I also thought of it as "quirky in many ways". It is not your typical rock arrangement. My feeling was that the band should have come in sooner, but the tension that's created by making the listener wait a little longer through building the instruments is brilliant - and very Grohl.